In the collection of the Yale Center for British Art, which has both zoomable and downloadable files. There is also a zoomable file on Google Art Project, and a downloadable file of that image, which is slightly larger and more colorful, on Wikimedia Commons. William Henry Millais, the elder brother of John Everett Millais, and also part of the Pre-Raphaelite Brotherhood, was known for his paintings in watercolor and gouache. The center’s website lists the medium for this work as “oil on canvas”, but I think that’s a mislabeling. Josh Keyes is an Oregon based painter whose themes include graffiti on objects where it would not normally appear, animals intersecting with civilization in thought provoking ways, and scenes in which nature is reclaiming what appears to be a recently post-human world. The latter theme is sometimes expressed in compositions in which the elements have been squared off and isolated, as if a slice of his alternate reality had been carved out by a cosmic cookie cutter — producing a diorama-like object in which water is presented as a block. In these he not only shows the works on civilization inundated by the kind of shallow but still disastrous levels predicted for seal level rise brought on climate shift, but also juxtaposes a variety of animals with human made artifacts. Sharks prowl beneath war monuments, alligators lurk next to cowboy memorials and seals cavort around submerged mail boxes. You can find more of these among his older works in the Paintings: Gallery II section of his website. In additon to that and the Paintings: Gallery I section, there is an unfinished Gallery section with more images of his work. Many of his works that show woodland elements are beautifully realized and can be appreciated just as landscape paintings, concept aside. There is a brief interview with Keyes on Art Threat. Keyes works in acrylic on wood panels. He is married to painter Lisa Ericson, who I profiled in 2016. As I mentioned in my post on Élisabeth Louise Vigée Le Brun, one of the tragedies of the level of misogyny in the history of art — in addition to the personal tragedies of women whose passion for creating art was denied by societal “norms” — is the unknowable number of possibly brilliant women artists whose contributions we have denied ourselves as a culture. Though opportunities for women artists are better today than in the past, women still must face disparaging attitudes and assumptions based on their gender about the value of their work. In the past, it was even more pronounced, and artistic endeavors like painting and sculpture were largely considered “inappropriate” pursuits for women. There were exceptions, of course — women who by luck or right of birth or grit, determination and persistence managed to establish themselves as artists of note in spite of the odds against them. The National Museum of Women in the Arts in Washington, DC is a museum and organization dedicated to highlighting, promoting and increasing awareness of the contributions of women artists. I have to say that when in Washington I have difficulty getting past the mind-boggling collections of the National Gallery of Art to visit other art museums in the city. (It’s only in the past few years that I’ve even gotten to the amazing Smithsonian American Art Museum, and I have yet to visit the National Portrait Gallery.) So while the the National Museum of Women in the Arts is certainly on my list, I just haven’t made it there yet. I’m looking forward to spending more time in D.C. and visiting the museum this summer. In the meanwhile, their website not only describes the museum and their mission, but offers highlights of their 4,500+ object collection. In addition to viewing items from the collection that way, you can browse or search their artist profiles, which give biographical backgrounds and also feature images of the artists’ works. Just from this small sampling in one museum, imagine if we had been more open minded as a society and had access to a hundred times this many more women artists from history, how much richer we would be for their contributions. There will be no new posts today on Lines and Colors about art or artists, no lovely images of art to inspire or amuse you. This is perhaps a portent of things to come, but today it’s just a protest. 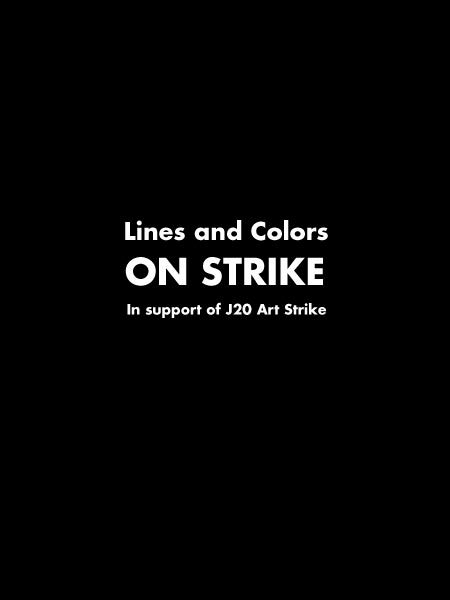 Lines and Colors is on strike today in support of the J20 Art Strike, calling for arts organizations and institutions to not do business as usual as a symbolic act of resistance to the looming shift in government power, and the potentially disastrous effect it will have on the arts, humanities and creative endeavor and discourse in general. Yes, it’s a small, mostly symbolic gesture, but so are the recently announced plans by the incoming administration to eliminate funding for the National Endowment for the Arts and the National Endowment for the Humanities, as well as the Corporation for Public Broadcasting. It would cut $296 million from the federal government’s almost $4,000,000,000,000.00 federal budget as a “cost saving” measure. Even ignoring the fact that it’s been demonstrated that every Federal dollar spent on arts funding brings back nine or ten times that amount to the treasury in the form of increased economic activity and tax revenue, the amount of “savings” represents less than two tenths of one percent of the federal budget – for all practical purposes, statistically insignificant. So this is really a gesture, a raised middle finger to the arts community to let us know how much they despise us. Given the avowed intentions and previous actions of many of the legislators now taking control of the congress, this is likely just the first in a series of ongoing actions that will make the creation of art and the free exchange of ideas more difficult in the coming years. In the past, I’ve tried to keep my political views in check when writing Lines and Colors, and have only expressed them in subtle ways. These people have declared themselves the enemy of much that I care about, and are therefore my enemies. Little acts like this, and anything I may say, are also likely statistically insignificant, but I have to make some kind of symbolic statement of resistance to avowed enemies of the arts, even if just for my own sense of self respect. In writing for Lines and Colors, I’ll keep my expressions of concern related to the arts, but I’ll state them clearly. If you don’t like them, you’re welcome to comment, but I won’t tolerate flame wars, and I reserve the right to control what does or doesn’t appear on my own blog. Lines and Colors is, after all, my opinions about art and artists — what I find valuable or of interest and consider worth sharing with others. If the expression of my political opinions as they relate to the health of the arts community in this country offends you, you’re welcome to seek inspiration elsewhere. That is, of course, if Lines and Colors is still here in four years. One of the other announced initiatives of the incoming wave of big business uber alles is the elimination of Net Neutrality — from which control of the internet will be ceded to the telecoms and big entertainment companies. This will happen so gradually you won’t notice at first, but it will change inexorably until the web becomes more like TV — a one-way flow of content and information from corporate producer to consumer, and a one-way flow of money in the other direction. Oh, you’ll still be able to use Facebook and Twitter, but big content sites from the corporate providers will download like lightning (if you pay for them), and independent sites like Lines and Colors will start to load slower and slower and slower until they’re too painful to use. If you don’t know what Net Neutrality is, or why it matters, see this handy explanation in comics form from Economix. For more on the strike, see the J20 Art Strike page. More to the point, if you want to know why I feel this way, see my plea to Lines and Colors readers prior to the election to vote in defense of the arts: “Vote like the future of the arts in the US depends on it“, in which I go into more detail on why I think this administration and the accompanying shift in power in the congress bode ill for the arts community in this country. "Vote like the future of the arts in the US depends on it"
John Martin was a 19th century British artist noted for his dramatic depictions of disasters and/or impending disasters. Here are two of his interpretations of the Biblical story of Belshazzar’s Feast, in which the arrogant ruler of Babylon shows his disdain for the enslaved population of Israelites by using their sacred vessels — stolen from their temple — to serve wine at a huge celebratory feast. A hand appears and foretells Belshazzar’s destruction and punishment for his arrogance by writing on the wall (from which we get the modern usage of the phrase) in cryptic glowing inscriptions. Belshazzar is unable to read the writing on the wall. The prophet Daniel is summoned to interpret the inscriptions, and informs Belshazzar of their meaning. Belshazzar, unwilling to be taught humility, ignores the warning and soon after meets his fate. The mezzotint is a plate from Martin’s “Illustrations to the Bible” and is in the collection of the Tate, Britain. The painting is in the collection of the Yale Center for British Art, and is actually a small version of a monumentally large painting that is in a private collection. I actually think the dark composition of the mezzotint is more successful at conveying the sense of dread and impending doom. Link is to zoomable image on Google Art Project; downloadable file on Wikimedia Commons; original is in the Ny Carlsberg Glyptotek in Copenhagen. Danish painter Christen Købke invites you to step into his late fall landscape to view the castle beyond the trees. I find particular fascination beyond the castle in his handling of the clouds — rich with painterly finesse and subtle variations in color as they emerge from his wintry sky.